Gold awards for Melbourne whisky label Starward are helping Australian whisky gain traction internationally. Photo: Shaiith. When it comes to making whisky, the airfields of Essendon are a long way from the misty Isles of Scotland, both in distance and in romance. But Melbourne whisky label Starward is lapping up praise after winning Best Craft Distiller Whiskey at the recent San Francisco Global Spirits Competition for its wine cask matured single malt. The same whisky also received a Double Gold medal, which means it received top marks from each of its category judges. 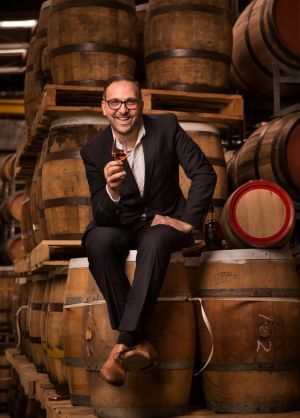 “I’m very proud of the team and what we’ve achieved,” says founder David Vitale, 42, whose New World Distillery started producing whisky out of its headquarters in a former Qantas maintenance hangar in Essendon Fields, six years ago. David Vitale of Starward Whisky in Essendon. Photo: Simon Schluter. In a “double-win” for Victorian distillers, Healesville gin Four Pillars also received a Double Gold medal (its second) at the awards, which received a total of 1899 entrants. Starward also picked up gold for its Solera single malt and, at the World Whiskies Awards held in London a few weeks earlier, it won two gold medals and Best Australian Single Malt Whisky. Starward is one of only three Victorian-made whiskies (there’s Bakery Hill in Bayswater and Timboon Railway Shed Distillery in Timboon) but Australian whiskies are slowly gaining overseas traction. In 2014 Tasmania’s Sullivan’s Cove was named world’s best single malt at London’s World Whiskies Awards and this year Lark Distillery won Best Australian Single Cask Single Malt Whisky; Perth’s Limeburners single malt received a bronze. Starward’s recent competition success comes on the back of a $10 million capital injection late last year, which included the backing of global alcohol beverage company Diageo, behind global brands such as Johnny Walker. Wild temperature rides like the ones we’ve been experiencing recently cause the whisky liquid to rapidly expand and contract inside Starward’s used Australian red wine barrels, fast-tracking alcohol evaporation and flavour extraction. Consequently, Vitale says mainland whiskies like his only require two-and-a-half-to-three years to mature, unlike drops from more stable and cooler climates that typically need at least four. New World Distillery currently produces nearly 1000 bottles of whisky per day, seven-days-a-week. Although they are not selling the equivalent of that yet Vitale says they have established an export base in the UK and plan to double production in October. Next year he hopes to break into the lucrative US export market. For the time being, though, Vitale says knowledge about Australian whisky remains limited to the “tweed jacket-wearing, pipe-smoking big moustaches and beards brigade”. This story was first published in the Saturday Age, 9 April, 2016.